Written by Janet Choi on April 30, 2015 . Sure, welcome emails are vital. They help acquire that critical feeling of trust that anchors a stronger customer relationship. Research by ReturnPath even shows that welcome messages not only boost engagement but predict long-term subscriber behavior and revenue potential. But the blank page is always nerve-racking, especially when you’re trying so hard to create a really great first impression. 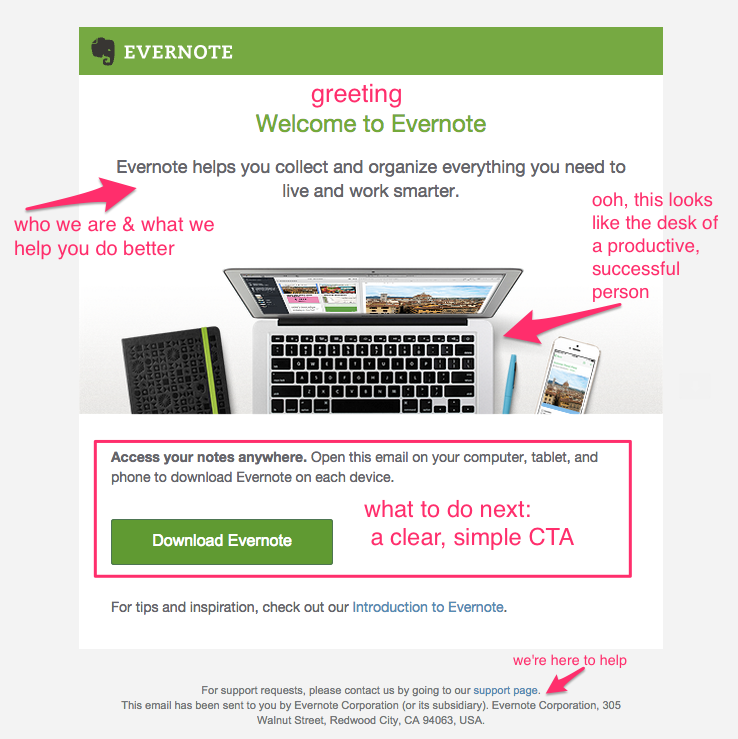 So we’ve gathered examples of 5 different types of welcome emails that many businesses use — with copy templates you can use and adapt to get started. General product / service: The basic welcome message from a business, app, or website once you sign up for an account. Newsletter Subscription: A welcome to your marketing world, whether the goal is to nurture leads, build an audience, engage existing customers, or promote sales. 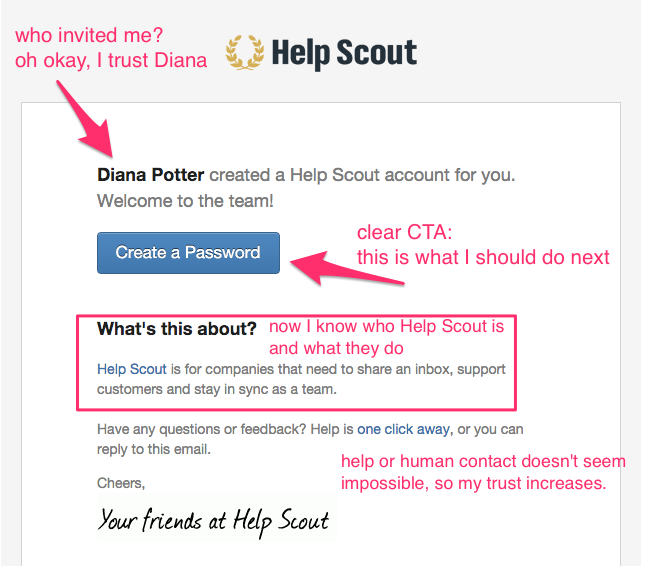 Personal outreach: New signups automatically receive a personal welcome email from someone in the company. 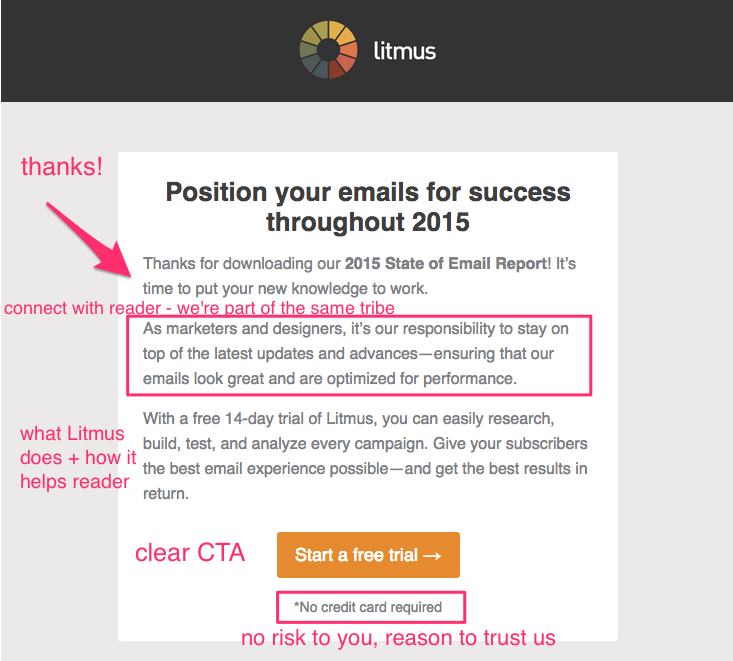 This has become a standard email practice for many startups. 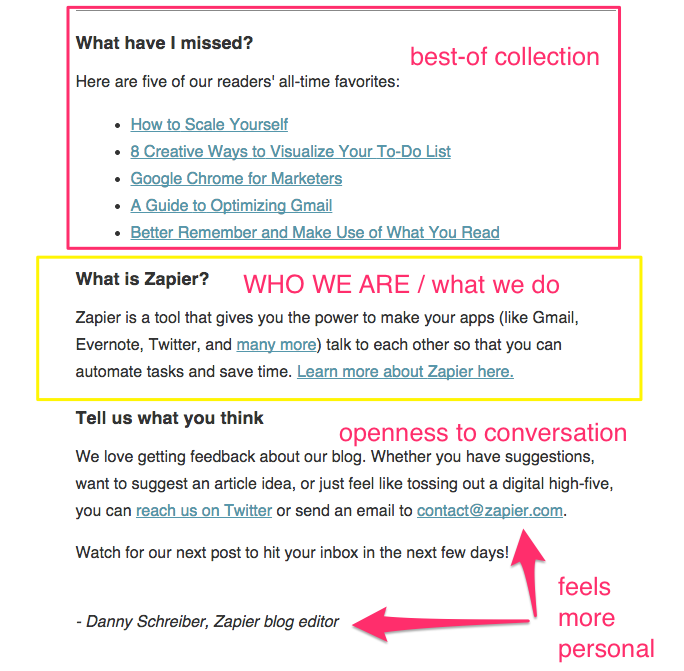 The following 2 types are less common but still important to categorize as welcome emails and treat with the same care. Free Sample Welcome: Companies often offer free content in exchange for an email address — it’s just as crucial to make a memorable first impression here. Invitation: When a teammate or group member invites others to a product or service. Want your own editable version of these 5 copy templates?Download now (and get a bonus swipe file)! First, review our tactics for how to create a trustworthy first impression plus the 3-part Princess Bride formula you need in all welcome emails. Also consider the context, timing, and flow of your welcome emails — in relationship with each other and other messages. For example, if you have a verification step to confirm an email address, will that be in a separate email or combined with the welcome message? What’s the action that triggers the welcome — a signup, purchase, promotion, or contest — and how will that inform your approach? Now let’s look at examples and copy templates that you can start using today. The templates refer to an imaginary productivity app called Prioritizer. Our number one tip to get the most out of Prioritizer is to download our browser extension and give it a whirl. [how it helps] It’ll make sticking to your priorities super simple and just a click away. Have any questions? Just shoot us an email! We’re always here to help. Grab your editable template here. What’s going to be in the newsletter? What type of content will it link to? 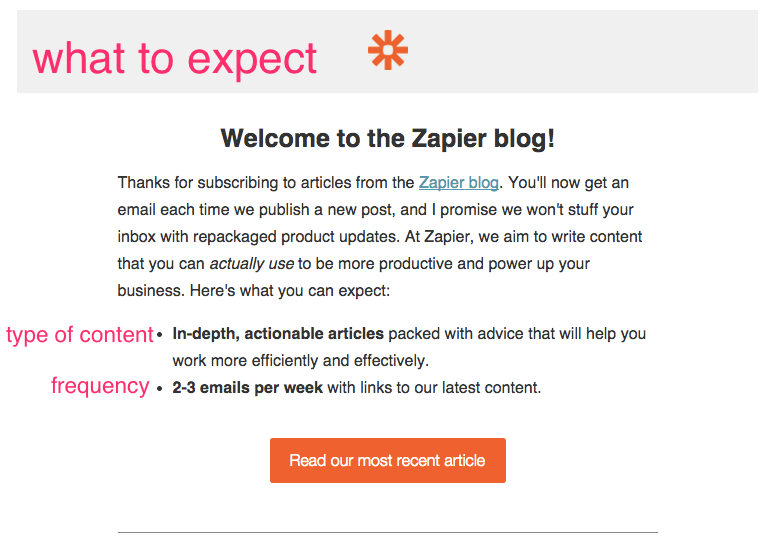 How often and when will subscribers get newsletter emails? If your blog publishes multiple times a week, will you send an email with every new post or offer to set email frequency preferences? Are you going to share a best-of collection of reads or a freebie? Subscription confirmed! Welcome to the Buffer email club! We’d love to chat. Just hit reply to this email or any of our newsletters to get in touch with feedback, questions, or ideas for us! Have an awesome day! p.s. Want to check out our Prioritizer app? Head here to sign up for a free trial. Be personal, as if you were sending an email to a friend. Use simple formatting and plain design. Consider flow. If this is the only welcome email you’re sending, incorporate all the elements in the general product/service welcome. If this message is part of a welcome or onboarding series, consider timing and goals. I’d love to hear whether you think Prioritizer helps fulfill your big goals or what we can do to improve. If you have any questions about getting started, I’m happy to help. Just reply to this email! Let’s do great things together! p.s. I love reading about productivity but hate wasting time finding quality stuff. What’s your favorite source of good reads? You’ll also start receiving weekly emails with thoughtfully human-curated content and our best blog posts full of actionable advice and food for thought to help you get more done. If that’s not your jam, no worries – just click the unsubscribe link. [explain who you are, make a short pitch to give context for your call to action] At Prioritizer, we’re only interested in lifehacks that make it easier to focus on accomplishing great goals — so much so that we made an app for it! We help you keep a realistic to-do list of priorities. [CTA] Check out our 30-day free trial! p.s. Think this guide is helpful? Just click here to share with friends and colleagues. Who invited the reader or created the account? Who are you and why should the reader also sign up? p.s. Once you’re all set up, we recommend downloading our browser extension. It makes Prioritizer a lot more useful!